Since 1960, we are always dedicated to offering outstanding quality products and service. Our team of professional employees are ready to exceed customer’s expectations day after day. Call Baker Door Company today at 717-901-4056 for more information on garage doors in Lebanon, PA.
Why not changing your garage door to transform the look of your house? Craftsman house‑style corresponds to the history of Lebanon: typical characteristics include intricate woodworking, detailed stonework and arch doorways. To find the garage door that will best fit your house‑style, take a look at our image gallery. You will undoubtedly find the product you are looking for among the full range of choices available. Need garage door emergency services? Because an emergency is never scheduled, we offer 24‑hour emergency services for virtually any needs. Are you more in need of a garage door repair service in Lebanon? You can fill out our convenient online form or call us at 717-901-4056. Our service area covers from Mechanicsburg to Lebanon, including Camp Hill, Harrisburg and more. At Baker Door Company, we have the parts needed to repair a broken spring, a damaged opener or replace old weatherstripping. And if you want to give some uniqueness to your door, our decorative hardware will help you with your project. We are the specialist to contact for a garage door repair in Lebanon! 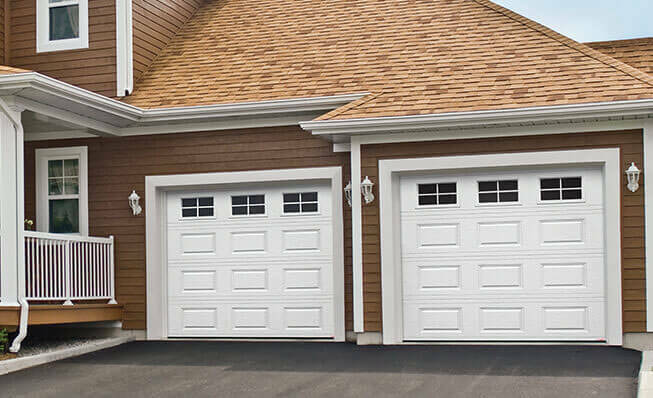 Which garage door is recommended in Lebanon, PA? Weather around the city is not usually extreme: a few hot days in summer, sometimes the period without having any rain is a little too extended, paired with some cold days in winter, and occasionally some blizzard. We highly recommend the Garaga Acadia Collection. These garage doors have an R‑12 insulation factor and a solid construction panel. How choosing the best door opener? You probably want an opener that operates smoothly and is reliable. The LiftMaster products, what we recommend, answer all those criteria and even more! At Baker Door Company, we have openers that can be used for residential, commercial, agricultural and industrial garage doors. For your opener and garage door installation in Lebanon, do not forget that we are the professionals to call! Central Pennsylvania area including Harrisburg, Camp Hill, Hershey, Elizabethtown and more.